Amazing - we found out today that we are staying in the room next to the room used by Wolfgang Mozart when he stayed here. The hotel breakfast is very good and the great thing about being in this location is that we can get around early before the tourists come out. We took a quick look around the old town and realized that it can be seen quite quickly. We then went to the Tourist Office and worked out that a 48 hour Innsbruck Card would enable us to go right to the top of the Nordkette, give us what entrances we want to the other sights and free use of city transport until we leave for Saltzburg. 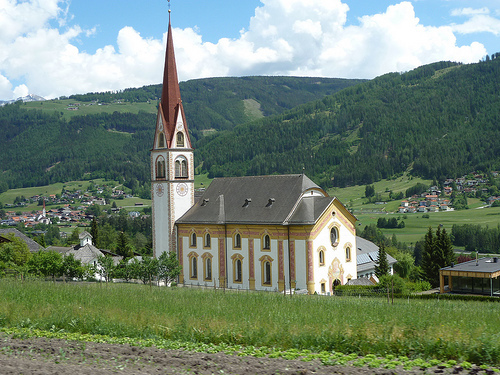 The first order of business was to ride the Stubaitalbahn up to Fulpnes. This is a narrow gauge tramway that is now run by the city. We started off running on city streets. When we reached the STB car barns, however, we went right through the yard and immediately started climbing. The grades are severe as is the curvature in places. The line serves small communities but it also goes through dense forests and there are several tall curved viaducts. Four lads got on with their bikes for a ride uphill. When it came time for them to get off, they pressed the door open button, got on their bikes inside the tram and rode straight out on to the platform. They have great confidence in platform heights being close to car heights. 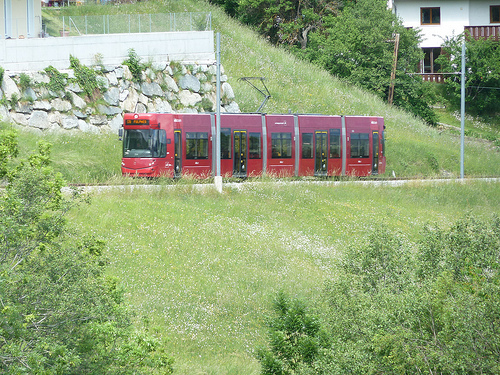 The first tram took us to Kreith which is a little way from the end of the line. We had no idea where Kreith was but it seemed to be in the right direction so we went out on the tram anyway. Each tram has a number of screens which give the next station and the next three stops so it was easy to find out when we were getting close to Kreith. 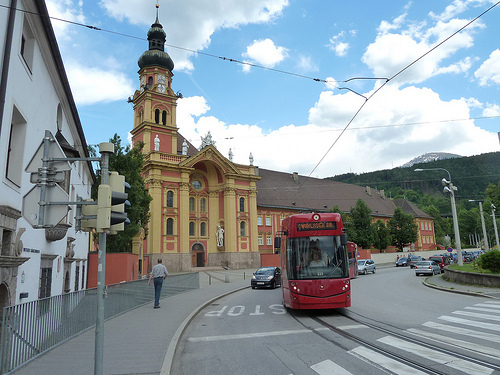 We had to wait 30 minutes for the tram to take us to Fulpmes which is quite a large village but there was very little open on a Sunday so, after an ice cream, we decided to return to Innsbruck. Lunch was a pretzel and shandy in a church car park. The owner was very pleasant but a bearded model started operating every so often. Someone was watching motor racing on TV inside. There were large umbrellas which had just been taken down when a heavy wind storm came in. 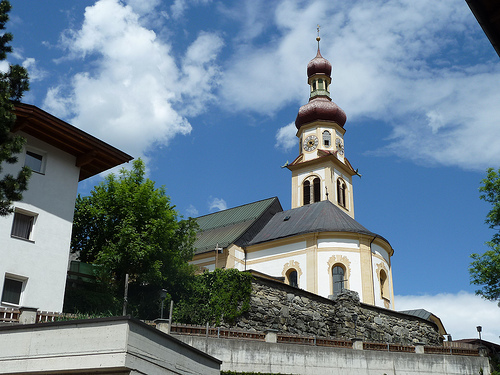 We got out at the Stubaitalbahn station and walked to the terminus for the tram to Igls, stopping for a shandy at a bar which had been set up at a church parking lot and close to the cemetery. Waiting for the tram we noticed a great number of people with bicycles, about 20 in all. Then a substitute bus turned up. We got on board and sat down to enjoy the fun. There were four bicycles and two large dogs in the bus and four bikes on the rack outside at the back. After some frantic calls over the radio, a city pick-up truck arrived with a trailer to carry the excess bikes. All the passengers scrambled into the bus which felt as if the heating was on full bore. 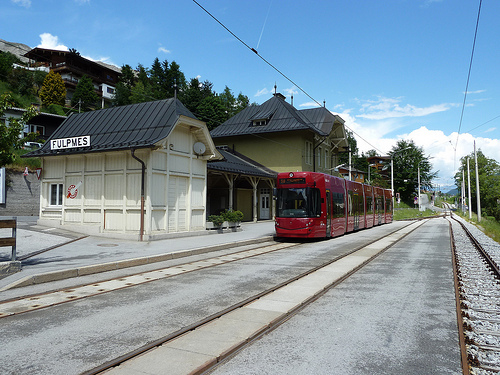 A tram would have been more useful but we eventually got to Igls. By this time it was raining so we decided to stay on the bus which brought us back to Innsbruck and a connection with a tram back to the hotel.